Who's snag is this, anyway? Guess who won. 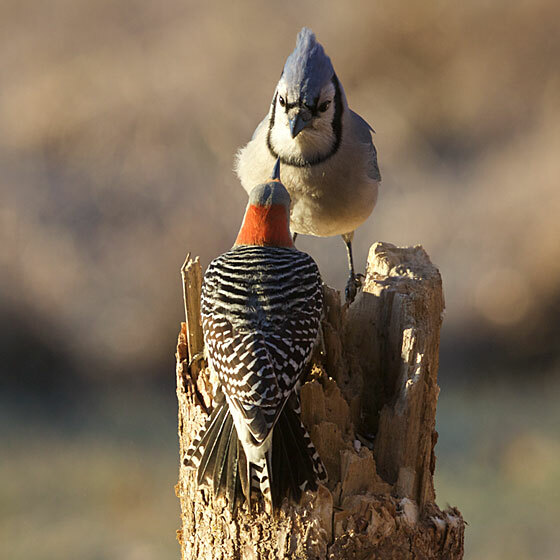 The blue jay has a big head which when the crown is puffed up looks even bigger, and the jay outweighs the red-bellied woodpecker by about 20%. The woodpecker shows her indignation by fanning out her tail. Which lets us see that the outer tail feathers have white spots, the center ones are black-and-white barred, and the others are mostly black. Very decorative and impressive, don't you think? Woodpecker prevailed. Blue jay made rapid exit stage right. 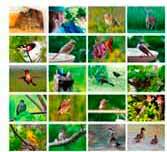 Bring wild birds to your home! Watch them up close. Get to know them as individuals and learn their personalities and quirks. Here are some feeders to delight both birds and people. Click to enlarge.